Because of the late posting of this weeks Hits and Misses, I will simply list the players I believe can out produce their respective rankings. 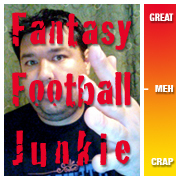 I had been singling out one fantasy expert the past several weeks till now. This week I return to the cumulative rankings from our friends at ESPN. Last week was not good. I care not to get into it much. Going 1-5 can do that… but if you want to see who I picked, here is week 8’s H&M. It’s just too low for me. I don’t like Jackson as a long-term or even short-term reality quarterback but I do like the weapons that Pete Carrol has assembled for him to pass to. With Sidney Rice and Mike Williams and up and comers, Obomanu and Baldwin, Tarvaris has a good cast to chuck the ball down the field to. I believe the Cowboys win but I feel like Seattle can make some things happen through the air. Come’on! Unranked? He has Brandon Jacobs in front of him this week as the starter. And I can’t stand Jacobs as a fantasy back. He’s such an injury risk and is probably going to get hurt again. Not to mention that the NY Giants are also without Hakeem Nicks in this contest at New England. I could see this being a shootout, which bodes well for Ware in passing situations. Look for him to get around 10 touches when all is said, and hopefully a score! I was so tempted to take Ben Obomanu here who could easily be just as productive or more than Baldwin. It’s not safe to choose both as Mike Williams is expected to return this week so that is going to take a bite out of someones targets. I believe Baldwin stays in the game on more snaps leaving him with a top 30 stat line! Sixteen? He’s had two solid performances in a row as Vick is starting to trust him more and more. And with the Bears coming to town, I believe the Eagles use Celek to exploit the middle of the field. Someone is going to shadow McCoy, right? Of all the rankers, I would like to point out Karabell for ranking him 21st! Shame on you Karabell, shame on you. Going up against the terrible Cardinals is a plus. Unfortunately the Rams may have spent all of their good fortune by beating the Saints last week… so who knows which team shows up here. I expect a heavy dose of SJAX in this one and if Bradford plays I like the Rams to be inspired once more!